Hamilton Filmalter has just finished a series of Revival Conferences with PCCF Pastor, Layth Ibrahim in Duhok and Erbil, the Capitol of Iraqi Kurdistan. This was a wonderful as well as powerful time of refreshing for our people in the region. Many came to know Christ and there were powerful demonstrations of God’s Presence as people were miraculously touched and healed. Others were baptized in the Holy Spirit. Pastor Layth shares the details in his own words. I’ve only made a few minor corrections to his English for the sake of clarity. God blessed us very much over the last 10 days with Hamilton and Don. We started out in homes after we arrived in Duhok and in every home we visited, God was there and we saw people call their Neighbours. All the people in the home were saved just like at Cornelius’s house. The holly Spirit come down on all those who were listening to the message and God started to heal people. Next day we visited another home, Gulay’s Family (Gulay is LaDawna McKinnis’s Syrian interpreter) and all of them asked Jesus to come to their hearts and the Holy spirit came on them also. On the day of our conference, We started the worship time and we saw people blessed and then Hamilton started to preach about Jesus and the story of redemption. The Holy spirit came down and people were touched and started to pray. Then we started to pray for them and call them to come to the front for their healing. The people who came to the front got healed. Now I want to tell you about our Conference in Irbil. When we arrived there, we also started by visiting people at their homes and praying for them and what happened in Duhok happened also in Irbil. And when the Time of the conference came, Pastor Deler of the Holiness Church prepared the Hall and the Conference. So they start to sing worship songs, after a while… I start to ask the congregation about their faith and if they believe in Jesus. 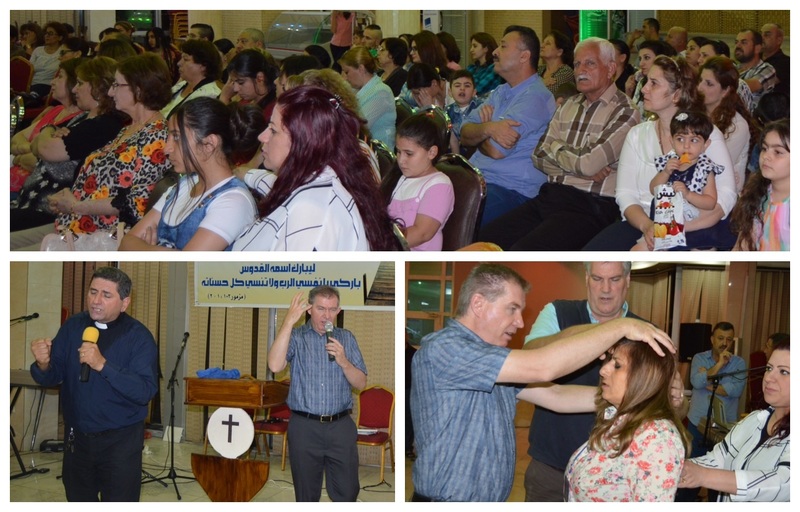 THE LORD IS MOVING POWERFULLY IN IRAQ DESPITE THE WICKEDNESS AND PERSECUTION ONLY A FEW MILES AWAY.